I usually make this on the stove, cooking it all day, but this time I decided to adapt it to the crockpot. It was just as good in the crockpot, maybe better because it’s easier. Prepare the beans by rinsing them and picking through them to remove any little stones. Soak them overnight or do a quick soak by covering them with boiling water for and hour or two. Drain them and put them in the crockpot. Chop the onion, garlic and sausage and add to the crockpot along with the other ingredients. Pop the lid on and cook on high, at least 5-6 hours. I don’t think you could overcook these. I serve the soup over brown rice. It’s also good with cornbread. If you have an Instant Pot, then you’ll want to check out my Instant Pot Mixed Bean Soup version of this favorite. And the entire collection of The Best Easy Instant Pot Soup Recipes. 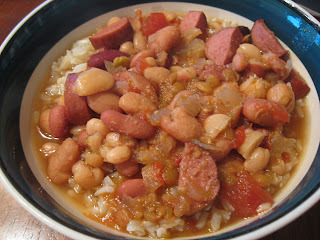 This recipe always reminds me of a cat we used to have named Harley Davidson (he had a very loud purr). He didn’t usually eat people food, but he loved the “gravy” part of this soup. RIP, Harley. You were a good cat. There we go thinking the same again…I’m planning to make beans later today. These do look great! Yum! sI love cooking in a crock pot and this looks delicious. Oooo. I’m putting this on the menu for this week. I’ve got some wonderful all natural chicken sausage that would work perfectly. Thanks again for helping unclog my brain regarding dinner. This looks divine! I love it! 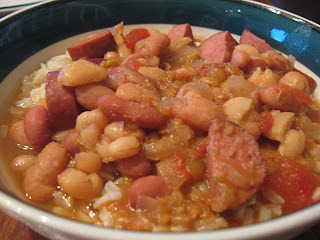 Yum, this soup sounds great with the smoked sausage! The beans look so delicious. I could go for a big bowl right now! Oh, yum! I love bean soup. I’ll have to try it in the crock pot. That is a great idea! I really appreciate the way that you lay out your picture of the finished product, ingredients, directions, etc. You really do make this so simple for us to follow! Thank you! That sounds delicious! I’ll be saving this recipe for later. I’m going to make this soup in honor of Harley! My cats will probably like the gravy part of it, too. This recipe looks yummy! I have one question though; can it be made with a 16 bean mix? I have one and was looking for a good recipe to use and thought this may be it. Felina, yes 16 bean mix would work great. I think I used something similar. Happy cooking! This Recipe really sounds good but could i possibly leave out tomatoes as i can’t have them & possibly add some more chicken stock? Becky, you can leave the tomatoes out. I don’t think you’d need much or any more broth. I was wondering if this could be made with smoked kielbasa? 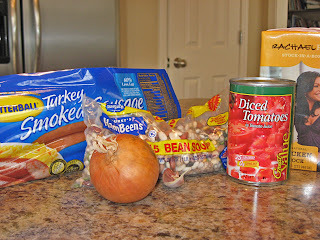 If I wanted to use canned beans, which beans would you suggest? Maybe pinto, butter beans, kidney beans, chickpeas.